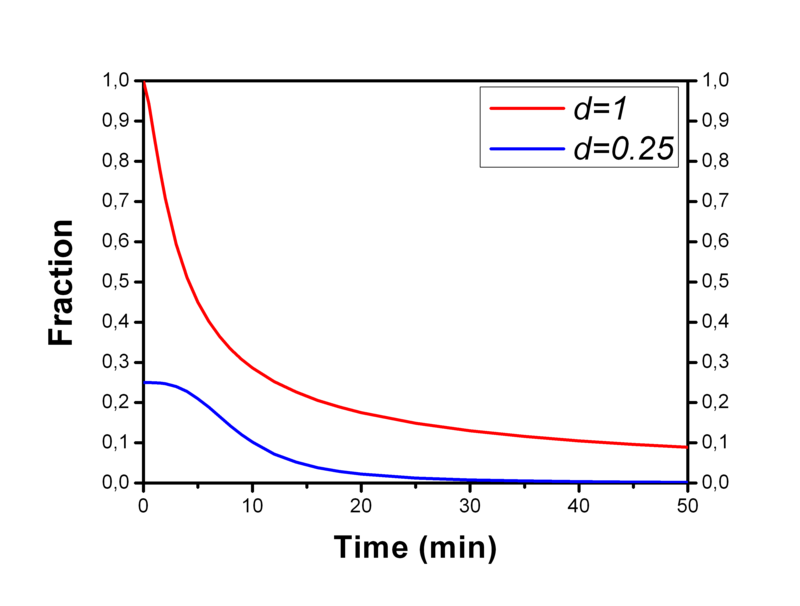 Power functions have been used to fit the fractions of parent radiopharmaceutical in plasma. , where 0 < a ≤ 1, b > 1, c > 0, 0 < d ≤ 1, and e ≥ 0. Parameter d represents the initial level of parent fraction, and parameter e is the time after which the fraction starts to decrease. Unchanged (parent) radiopharmaceutical fraction curves can be fitted with fit_ppf with option -model=PF. If parameter d is set to 1, we have essentially the same function as was proposed by Meyer et al. (2004), and if additionally parameter b is set to 2 and delay parameter e = 0, the function is the same as used by Watabe et al. (2000). If you prefer a function that approaches a steady level above 0, then use the Hill functions. Thanks to Matteo Tonietto for notifying of a typo in the equation.